Integrating VWO with your Joomla site allows you to create VWO tests without modifying a single line of code on your website. Sign in to your Joomla dashboard using your admin account credentials. 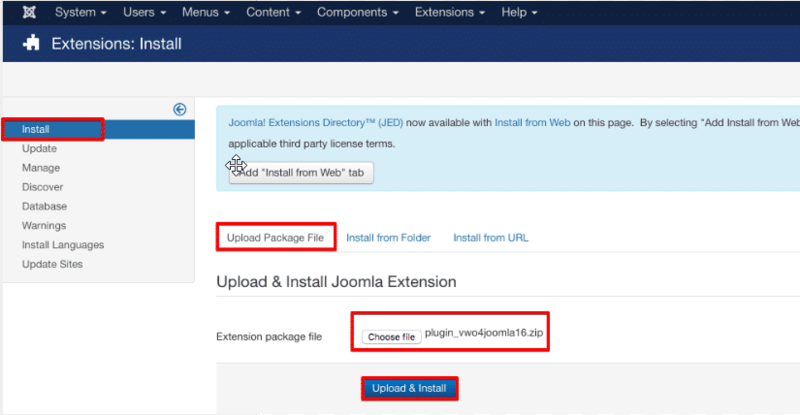 Under Upload Package File, click Choose a file and then select the Joomla zip file downloaded earlier. Click Update & Install. On the next page, click Manage and search for “visual” in the search bar. Select the VWO plugin from the list and click Enable to activate the plugin. Go to Extensions > Plugins section. On this page, search for “visual” in the search bar and select the VWO plugin from the list and click Edit to configure the plugin. Under the VWO ID field, provide the account id for the VWO account and then click Save & Close. Congratulations! You have successfully integrated VWO with your Joomla website. You can now go ahead and create tests on your website.